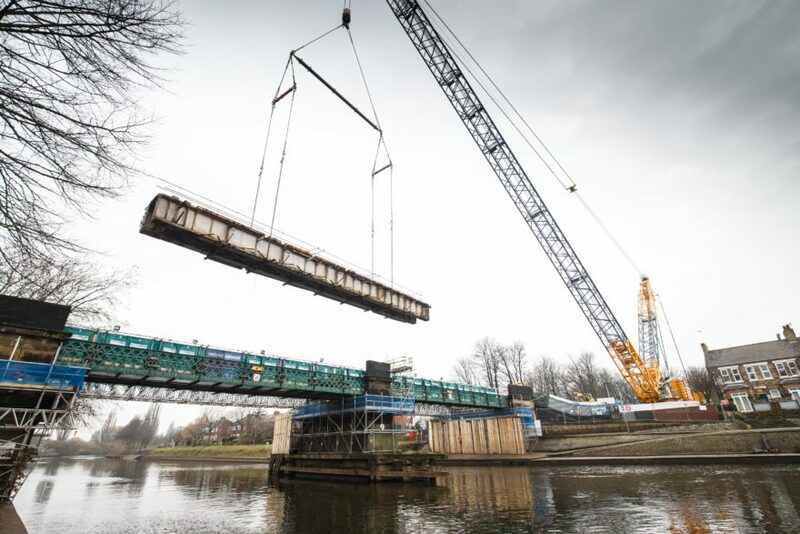 Network Rail invested £6m to deliver the most significant improvements to Scarborough Bridge in York since the bridge was built in 1875. This high profile project near the historic centre of York was successfully delivered despite a short lead in time and limited access to the site. This was only achieved through a ‘one team approach’ with extensive collaboration between a wide variety of stakeholders including statutory bodies, local residents, suppliers and subcontractors. This project was one of the largest undertaken by Story Contracting and whilst it presented its challenges, careful planning and excellent collaboration by our teams ensured a successful delivery. The reconstruction of Scarborough Bridge was a challenging project due to the restricted nature of the site in a busy city sitting only 40m from York Station’s Platform 4. This high profile project demanded a collaborative approach not only between Network Rail and Story Contracting but with a wide variety of stakeholders. These included many statutory bodies, sub-contractors, suppliers and the local community as well as Train operating companies, maintainers and Station managers. When the route from York to Scarborough opened in 1845, trains crossed the River Ouse on timber arches, the sockets for which are still visible in the masonry pier and abutments. The latter incorporate archways allowing pedestrians free access along the banks. The spans were rebuilt in 1875 to comprise four 22m wrought iron main girders, ornamental lattice girders to both sides and a timber deck. The east side features a footbridge, tied to the main structure but effectively independent. Corroded ironwork and 140 year old rotting timbers were in a desperate need for intervention. The bridge, which is not heavily trafficked (two TransPennine Express (TPE) services use it every hour) had a RA0 load rating, meaning bridge examiners carried out regular inspections and had to be in attendance whenever a steam special crossed. The baseline effort involved in doing any major strengthening work to the existing structure made reconstruction the most cost-effective option. The bridge adjoins a conservation area and the local planning authority demanded that the facias of the new bridge emulate the original design. Inside the bridge four new weathering steel isotropic decks were installed. The existing footbridge was retained but repair was necessary. Successful delivery was achieved through a strong collaborative approach by all stakeholders creating ‘one team’. Working in this way was particularly important due to the extensive number of stakeholders who contributed to overcoming the projects many constraints. Train Operating companies were consulted on the most suitable time for the 9 day blockade. The maintainer was heavily involved to adjust signalling so as not to affect the East Coast Main line. Statutory authorities agreed the closure of river, footpaths, car park, removal of large 16” water main and street furniture, de-vegetation and replanting of embankment within a conservation area, removal of summer bat roosts and the noise mitigation plan. Our neighbours were informed through an open day, regular information and consultation including the use of social media. Extensive temporary works including a scaffold bridge and piled reinforced concrete pad for the 500T crawler crane. Detailed logistics planning for the core week including delivery of bridge decks and crane parts, lay down areas for old and new components and parking for the workforce. By working to our ‘one team’ ethos we were able to value engineer the project and ensure risks were carefully managed. In total 14 subcontractors were involved in the delivery of the project. To achieve our ‘one team’ we recognised the need to establish a joint working base. This was a key factor to the success of this project. We deliberately created an open plan office and by sharing our ‘one base’ with stakeholders. A greater skill base was able to be utilised in the most beneficial way for the project. Situations and issues were able to be managed in a proactive, rather than reactive manner. During the blockade a further £3m of work was carried out on the York to Seamer line. Our ‘one base’ became a control centre for the whole project, thereby extending our collaborative approach beyond the bridge teams to include Network Rail’s maintainer, minor works and delivery team and their supply chain. The location of the bridge and its close proximity of the site to the general public, neighbouring residents and local businesses was an enormous challenge. Noise and vibrations were an ongoing potential issue for residents, particularly during installation of the piles for the crane pad over a period of six weeks. Open space surrounding the bridge was extremely limiting. Marygate Car Park was the only option for a site compound. Network Rail obtained phased occupation of the car park through close cooperation with City of York Council (CYC). In cooperation with the local residents, 30 spaces were retained for their use. Disruption to a popular waterway was unavoidable. Consents were obtained for partial and full closures of the river. Close liaison was maintained with local fishermen, rowing clubs, barge owners and the local pleasure boat operator who also ended up providing the safety boat and pontoon for the project. Utilising this local knowledge and supporting a local business was highly successful. Delivery of the crane and bridge decks were planned overnight to minimise inconvenience and residents kept fully informed of the necessary on-street parking restrictions. The environmental impact was always an important consideration for our project team and through close cooperation with CYC and local residents a programme of replanting was designed to reinstate 75m of vegetation cleared for the crane pad which was within a conservation area. The main disruptive works took place during the blockade that ran from 23:30hrs on Friday 13th February to 05:25hrs on Monday 23rd February. A pro-active communication strategy for this major civil engineering project was crucial to help minimise the effects of the disruption caused by the reconstruction. Specialist consultants were employed to work with CYC to agree a noise mitigation plan. As well as extensive use of acoustic barriers, careful planning was used where possible to keep noisy activities to a minimum during the day, when this was not possible Story used such measures as battery operated chain saws, to reduce nuisance to neighbours. An open day was held on site in early December. Story assisted with invitations, planning and delivery of the day aimed at addressing any issues or concerns that were raised. The event was well received with 165 members of the public attending. The project created numerous positive PR opportunities to engage the local community. A replica Lego model was built for the open day and generated a lot of interest including hitting the headlines in the York Post. However, the Lego model was more than just a centrepiece; it allowed the project teams to demonstrate the challenges of the project to visitors and stakeholders. It was important for the project team to continue to engage with neighbouring residents, businesses and travellers during the Christmas period. Story designed a unique Scarborough Bridge Christmas card and along with a box of chocolates distributed these to site neighbours to say thank you for their ongoing patience and cooperation. In January, the upcoming closures of the footpaths and the Scarborough line required increased communication. Story printed and distributed letters to local schools, businesses and residents. Local signage was also provided around the site and at every railway station along the affected route to inform the travelling public and local community of footpath closures and give details of the work. With guidance from Network Rail Communications Team, Story actively engaged online audiences using #ScarboroughBridge. The spectacle of the 500T crawler crane removing and replacing the decks on its 84m boom (20m taller than the York Minster) was witnessed by hundreds of onlookers. Footage of the first deck lift generated nearly 32,000 views on Facebook. Working closely with Mabey Bridge the fabricator, Network Rail, the designer, we were able to adopt a swan neck design for the four new weathering steel beams, to allow the decks to sit on shallow 200m cill units which avoided breaking out existing masonry from the abutments and piers. The decks will demand no maintenance for 60 years. Using weathering steel will also reduce the need for future maintenance. The design allows full RU loading thereby increasing the capacity and reliability of this line. The pier and abutments were also strengthened and repaired. On the west side a cantilevered walkway was added delivering a safer working environment for track staff. The project was delivered ahead of programme and the team received no complaints during the core works. This was testament to the success of a ‘collaborative approach’ at its best. “The project has been a huge and a magnificent success from the planning through to the implementation stage and delivered £9m worth of work over the 9 days. This has been by far the most successful collaboration that I have been part of, with Network Rail, Story and all their sub contractors working side by side. Well done to all involved!” Darryl White, Scheme Project Manager, Network Rail. “Congratulations to everyone, great stuff! Much appreciated. “ Phil Verster, Managing Director, LNE & EM Route. “Stunning performance and a tribute to all the teams’ efforts and the superb project and route collaboration. “ Kieran Dunkin, Route Planning Manager, LNE & EM Route.